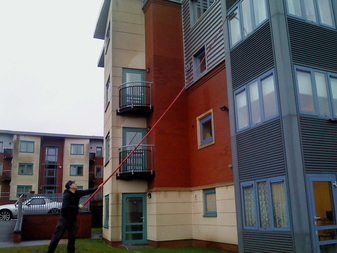 Window Cleaning has changed dramatically over the last 30 years. The consumer now demands more than just a dirty rag and a cheeky smile. Stringent attention to Health and Safety, working at height and and well organized working practices have become the hallmark of a professional Window Cleaning service. Window Cleaners also have to build up good working relationships with customers in order to gain trust. Be it in a commercial or residential setting, Window Cleaners often have unlimited access and free reign to come and go as they please. Trust therefore is the biggest factor in our work ethos. It cannot be bought, it has to be earned. . . . .
All our operatives are known by the company personally. We do not recruit from outside sources but prefer to train people that we already know and trust. You will find that no one employed by us will be found using foul and abusive language, smoking on site or causing any unnecessary disturbance. They are actively encouraged to get to know and interact with our customers. We find this helps to overcome issues if they arise and also helps our clients build trust with us; something that no amount of advertising can buy. Along with an umbrella insurance policy, it is mandatory that each operative has his own personal liability insurance policy. We find this encourages a greater sense of care.